Thanks to Mark Hamill, a dream of mine came true. I met Stan “the Man” Lee. 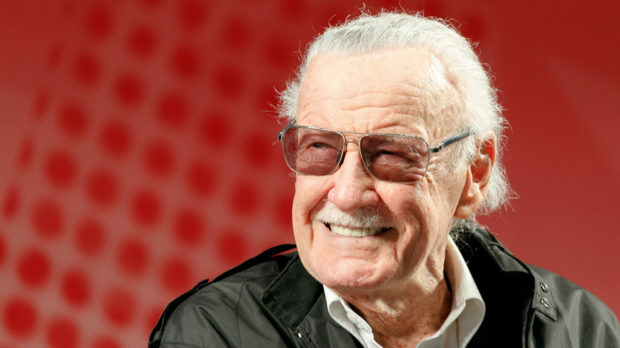 Stan is for me (as I’m sure for many of you) a mixture of hero, muse, patron saint, guiding creative force and more. Friday the 18th at Comic-Con San Diego, Stan stopped by the booth for Comic Book the Movie. (He is interviewed by Don Swan – played by Mark – in the film.) I had only time to shake his hand and exchange the basic praises “It’s a great thrill to meet you.” I think I said. A crowd began to gather around him. I mentioned he was a bigger draw than the lovely model dressed as Liberty Lass. He said something like “there must be something wrong with these people, look at her.” And then Stan had to dash off to his other booth promoting “Who wants to be a Superhero?” his new reality TV show for WB. But the best was yet to come. 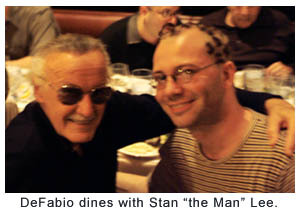 That night Stan was to join Don Swan, Mark Hamill and the folks from Creative Light Entertainment for dinner. As editors of this site Derek McCaw and myself were invited to attend. Rob Worley of www.comics2film.com was also invited. Silly me I was late to arrive, but luckily Stan was later. I found most seats were taken and Derek and Rob had the good fortune of sitting across from Baywatch Babe Donna D’Errico. I mentioned to them that they had the best seats in the house. Then Stan Lee arrived. The talented voice over actors who appear in Comic Book the Movie quickly surrounded Stan and serenaded him with the themes to the Hulk and Captain America (1966 era). Soon Stan and Chase Masterson (Deep Space 9, Creature Unknown) discovered the last remaining seats were near me. 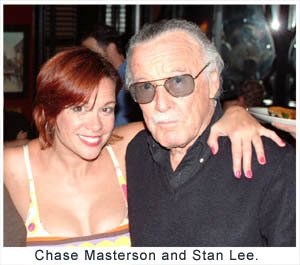 To be honest Stan’s attention was dedicated mostly to the lovely Ms. Masterson but I did manage to get a few edge-wise words in. I told Stan that much like Robert Fulghum’s book “Everything I needed to know I learned in Kindergarten,” everything I needed to know I had learned from Marvel comics. How to read, how to write, how to draw (the Marvel Way), and how to appreciate Norse myth, which I still do. I mentioned my high school rock band was named MJOLNIR and I had the hammer of Thor on my bass drum. He laughed and said I owed him royalties. Later with Derek and Rob we talked to Stan about his comics to film adaptations. He said Spiderman was his favorite so far. He was thrilled and amazed that the FX technology is now at a point where his stories can be told on the screen. Stan was amazingly charming, jovial and soon I felt he could be my grandfather. In a creative muse sort of way I guess he is.